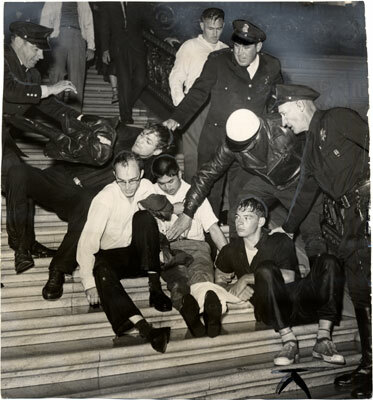 Students were washed down the stairs of the City Hall Rotunda when the police directed fire hoses at them. May 13, 1960, City Hall Rotunda. 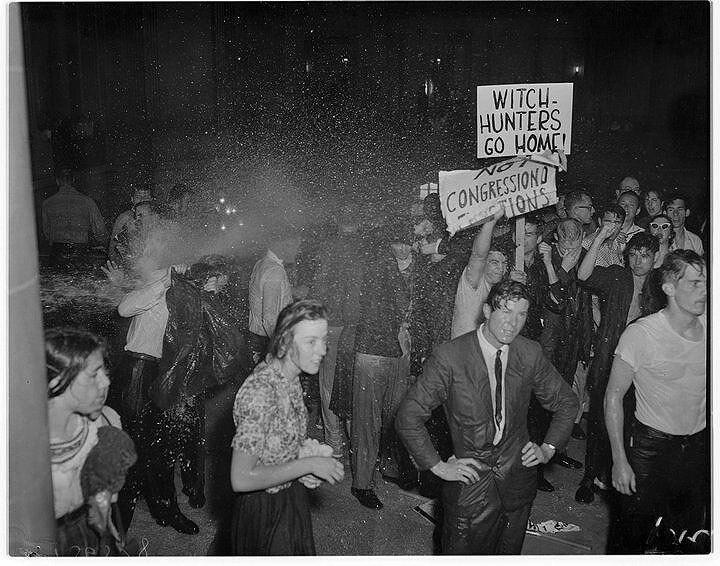 May 13, 1960: Civic Center, City Hall: House Un-American Activities Committee Hearing Riot: Students and other protesters in City Hall in SF decry the presence of the doddering, but still pernicious House Un-American Activities Committee. The Committee only deigns to hear from super-patriotic groups and individuals. After protesters were denied entrance, the police attacked and swept them out of City Hall's rotunda with fire hoses, with 64 arrested, and 12 people hospitalized (eight are police, mostly from exhaustion). Charges dropped against all but one demonstrator, he is acquitted in jury trial. 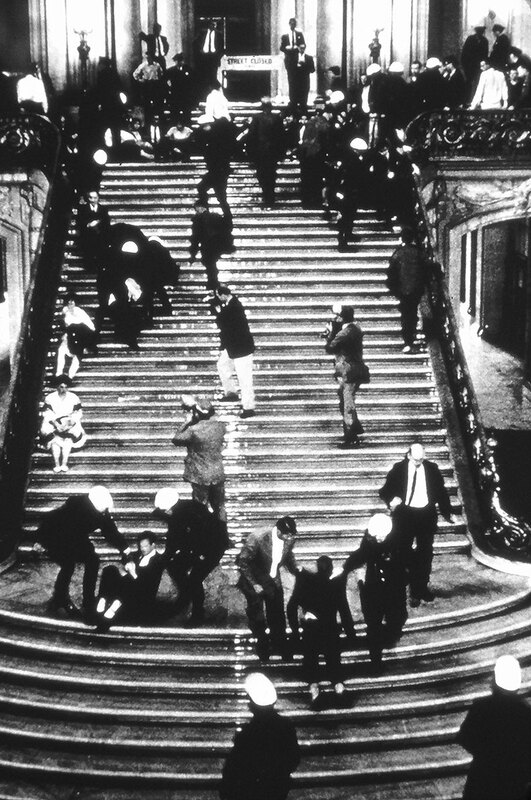 Operation Abolition, a propaganda film using footage of the City Hall riot, is sold in hundreds of copies, claiming it was instigated by communists. 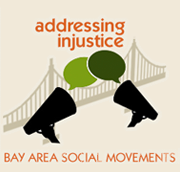 Mayor George Christopher endorses this idea and says he himself saw "known communists" leading the demonstrations, although he was in the peninsula suburb of Burlingame when the police attacked in the rotunda. TERRENCE HALLINAN: When Eisenhower was elected president, and with a Republican majority in both houses of Congress, they actually began to pass laws outlawing being a progressive. They had the attorney general compile a list after hearing by the Senate Internal Security Committee that McCarthy was one of the most famous spokespeople of, but there were numerous others before him, and they would come into a town like Chicago or San Francisco or Seattle and they would issue subpoenas to all the progressives in the town, especially the trade union leadership people, many of whom were communists, or had been communists, or had friends who were communists. They would bring them up in front of these committees and they would ask them if they were communist, and they would ask them leading questions. The only defense out there was, was to take the Fifth Amendment, and the consequence at that time of taking the Fifth was that you would usually lose your job, if you were in government service you would lose your job for sure. You would also be affected in your home. Your name would be plastered all over the papers, your kids would be mistreated in school, and it was hard times. So a lot of people would refuse to take the Fifth, and they would take the First. What would happen then, is they would ask them, “OK are you a communist?” They'd say “I refuse to answer under the 1st Amendment.” They'd say “Who are all your friends who are communists?” and they'd say “I refuse to answer.” If you ever said “I'm a communist,” the next question was “OK, who else is communist? Who are your enemies? Who are your neighbors? Who are your friends?” So it was a no-win situation. If you took the 1st Amendment like the Hollywood [Ten] people did, then you got held in contempt of court and you went to prison for various terms. Then they passed another act, the Smith Act, making it a crime to be a communist and they went around actively putting people in prison for that. It really was a frightening period. 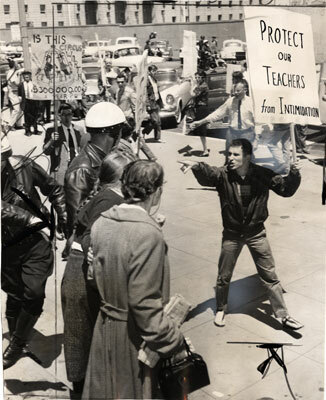 Anti-HUAC demonstrator points at police, May 1960. BECKY JENKINS: Not only were we yelling but it was reverberating on this marble floor. It was like a surrealist nightmare. And all along the balcony up above were city workers peering down watching, these were all the workers of City Hall, and they couldn't believe their eyes. The cops started to pull out the fire hoses and began using water to push us down the steps. Water came rushing down, and if you know what water and marble is like, it's like glass.... After that they organized a red squad so the police department could handle those things a little better. I want to tell you a couple of other things about the City Hall thing: One was, that it felt like a break of tradition, for me, it was like the beginning of building a new coalition in San Francisco. We had professors and students from SF State, from UC Berkeley, trade unionists, it was a tremendous coalition, telling the House Un-American Activities Committee that we had had enough. I remember after my youth of feeling so isolated that we were communists and now we had popular support. The whole community was coming together and they were protecting us. After we got washed down the stairs, we were all completely traumatized, and I remember going home and my mom and dad ... The next day after we had gotten washed down, I was really scared, but we all went back down to City Hall. The word went out and the longshoremen were there from the ILWU. This is what it meant to have a labor movement full of big guys. Those big guys came with their white caps on and stood in the crowd, and the cops were there on horses, and I remember my father's stories about New York and how the cops in NY were famous for using horses to trample striking workers, they killed workers. Horses were to me a symbol of police repression. But there were the longshoremen. In San Francisco the combination of bread and roses... at some point we stood under the balcony. I can't remember ... maybe the police chief, came out to the crowd, and the crowd began to sing the Chorale of Beethoven's 9th Symphony. This was the class of San Francisco. Soaked students in City Hall, May 13, 1960. TERRENCE HALLINAN: HUAC did become a real watershed here in SF. We said “no way,” and HUAC stopped. That was basically the end of HUAC. They rapidly packed their bags. The next day Civic Center Plaza was packed with people. They called off further hearings. HUAC left town in a few days and I don't think they ever held another public hearing after that. Of course people all over the country took hope in that, and right at the same time, all over the South people began to sit in at lunch counters, Freedom Rides were going on, and things were beginning to happen, and in short order the civil rights movement came sweeping over our whole country, and that was the end of McCarthyism. Is it gone? Certainly McCarthy is gone, and McCarthyism as it was then is gone, but I think we all know that the same forces that brought it about then are lurking in the wings, and given the right opportunity and lack of resistance by people they will come back again and they'll have different lists, and perhaps different enemies in some different form, but they are definitely ready out there to suppress people's civil rights and put labor and minorities against the wall. VIVIAN HALLINAN: The police chief at the time was Thomas J. Cahill, the man who ordered that the hoses be put on and so forth. I read in today's paper that the Hall of Justice is being called the Thomas J. Cahill Hall of Justice, for this outstanding police captain from the past. Becky Jenkins, radical therapist, activist from SF State circa 1960, demonstrated at HUAC in 1960. Terrence Hallinan, former member of Board of Supervisors, former District Attorney. Vivian Hallinan, mother to Terrence and long-time San Francisco activist. William Mandel testifies before the House Un-American Activities Committee, May 1960.